It's unlikely much has changed from 1.8, the tutorials should work fine. Some things will have changed, but you should be able to figure those out or ask us for help. However, I do have a working fluid/fluid block. Are you trying to make a block or a bucket? Your title and post say different things. If it's a bucket, just call FluidRegistry.enableUniversalBucket before preInit (in a static initialiser of your @Mod class) and then call FluidRegistry.addBucketForFluid for each Fluid you want a bucket added for. This will use Forge's universal bucket. Chisel Facades: For all your decorative pipe-hiding needs. Please don't PM me to ask for help or to join your mod development team. Asking your question in a public thread preserves it for people who are having the same problem in the future. I'm not interested in developing mods with people. Sorry about that I am trying to add a bucket for my fluid. I am getting errors in my BucketHandler file. /*This BucketHandler class is the one from Buildcraft, all credits to Spacetoad and the BuildCraft team. "getting errors" doesn't tell me much. Always post the error message(s) if it's a compilation error or the FML log if it's a runtime error. The code you posted is for 1.7.10, it won't even compile in 1.8+ because the FML classes have moved to a different package. You should be using Forge's universal bucket rather than creating your own, it will handle everything for you. I explained how to add your fluid to the universal bucket in my previous post. In future, please use Gist or Pastebin to post logs/crash reports (if applicable) and code with syntax highlighting. To get syntax highlighting on Gist, give each file the appropriate extension (.java for Java code). To get syntax highlighting on Pastebin, select the language from the dropdown at the bottom of the page. It's much easier to read code with proper formatting and syntax highlighting. Ok, I will always us Pastebin for code. You must have a solid understanding of Java before you can create a mod. You can't put statements directly in the main body of a class. As I said in my first post, FluidRegistry.enableUniversalBucket must be called from a static initialiser. FluidRegistry.addBucketForFluid must be called in preInit, after you create and register your Fluids. The code you posted is completely invalid, that's not how you call a method. Ok after I get this bucket working I am going to spend a week learning more about Java. I made some changes to my main file and i got no error messages. Then I ran Minecraft and the game crashed with this fml log. Only create and register Fluids, Blocks, Items, etc. in preInit. Don't create or register them in a static initialiser of your @Mod class, that's run before preInit. I'd recommend creating a dedicated class for each type to create, register and store singleton instances (like I do here). You never register your Fluid, you only register a model for its block/item forms. You can do this by calling FluidRegistry.registerFluid in preInit. FluidRegistry.enableUniversalBucket will actually register the Fluid if it's not already registered, so you don't need to register it yourself. The crash happened because you tried to create a FluidStack from a Fluid that hadn't been registered. FluidContainerRegistry is deprecated and will be removed in future versions, don't use it. I removed the fluidstack issue but I am getting another. 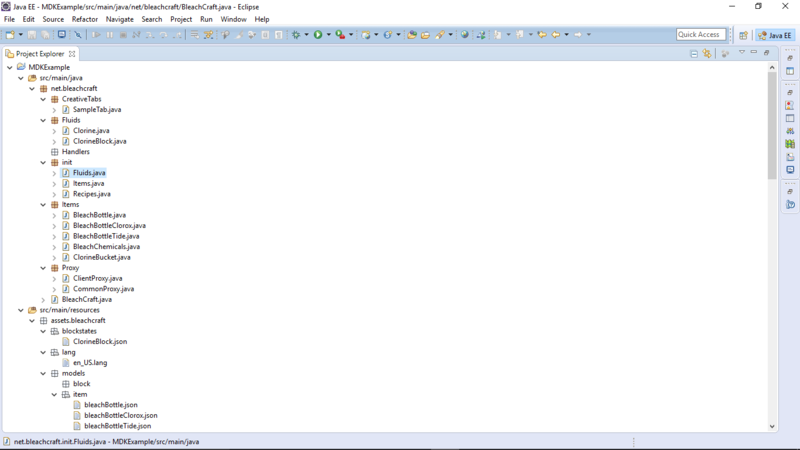 (the game crashes with errorless IDE) Here are my files and I don't understand why it crashes. Oops. I added clorine = new Clorine(); to my fluid registry class and I got no errors but when I ran the game I got another error (fml log) from the item registry class. Do you know what could be causing this? The RenderItem instance is only created after preInit, so you can't use it until init. That said, you shouldn't be using it to register your models; use ModelLoader.setCustomModelResourceLocation/setCustomMeshDefinition instead. You also can't use client-only classes like RenderItem/ModelLoader from common code (you'll crash the dedicated server), models must be registered in your client proxy (or a dedicated client-only class called from your client proxy). PSN: buy one for me! First, this is deprecated, you should be using ModelLoader#setCustomModelResourceLocation. Second, it's a client-only method, you're calling it on the server-side as well (which leads to a NullPointerException). That's not quite the case, the NullPointerException is caused by calling it too early. The FML state events (preInit, init, postInit, etc.) are only called for the physical side (the client or server program), they're not called for each logical side (the client or server thread). The physical (dedicated) server will crash with a ClassNotFoundException if you try to load a client-only class from common code, the physical client won't care. Sides are explained in more detail here. I got the fist part of what you said Choonster but what would I replace setCustomMeshDefinition with? ModelLoader.setCustomModelResourceLocation and ModelLoader.setCustomMeshDefinition are two separate methods corresponding to the two overloads of ItemModelMesher#register. The former maps and Item and metadata to a ModelResourceLocation, the latter registers an ItemMeshDefinition that maps an ItemStack to an arbitrary ModelResourceLocation. Each Item should use one or the other, not both.